Max's parents, Taube and Itzik, first met as children in 1925. Taube was the daughter of a tailor who hired apprentices in his shop, and Itzik was one such apprentice. The Jewish youngsters fell in love and dreamed of getting married even though Taube's family frowned upon the match. 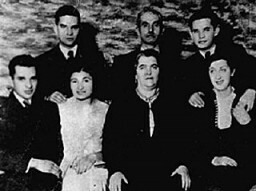 1933-39: In 1938 Taube and Itzik married. The couple lived in an apartment on 49 Zeromskiego Street in Radom, where Itzik opened a women's tailor shop. Max was born in July 1939. He had curly hair and blue eyes like his father. Two months after he was born, Germany invaded Poland. The Germans occupied Radom and evicted all the Jews from Zeromskiego Street. The Rosenblats had to leave everything, even Max's baby carriage. 1940-42: Radom's Jewish Council assigned the Rosenblats to a shack, which was enclosed in a Jewish ghetto in April 1941. Max slept in a homemade bed of straw. He had no toys and little food. In August 1942, when Max was 3, the Germans began rounding up and deporting all the Jews in Radom's two ghettos who could not work for them. Max's father tried to hide his family in his shop, but they were caught in a roundup and Max and his mother were taken away. They were marched to the railroad and herded into a boxcar. In August 1942 Max and his mother were deported to the Treblinka killing center, where they were gassed upon arrival. Max was 3 years old.